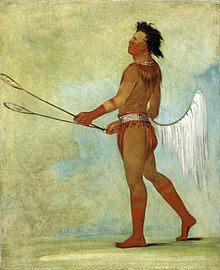 The Choctaw Nation ( Choctaw: Chahta Yakni) (officially referred to as the Choctaw Nation of Oklahoma) is a Native American territory and federally recognized Indian Tribe with a tribal jurisdictional area and reservation comprising 10.5 counties in Southeastern Oklahoma. The Choctaw Nation maintains a special relationship with both the United States and Oklahoma governments. As of 2011, the tribe has 223,279 enrolled members, of which 84,670 live within the state of Oklahoma  and 41,616 live within the Choctaw Nation's jurisdiction. A total of 233,126 people live within these boundaries. The tribal jurisdictional area is 10,864 square miles (28,140 km2). The tribe has jurisdiction over its own members. 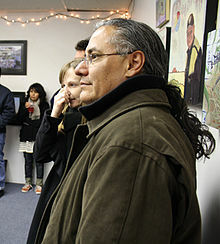 The chief of the Choctaw Nation is Gary Batton, who took office on April 29, 2014, after the resignation of Gregory E. Pyle. The Choctaw Nation Headquarters, which houses the office of the Chief, is located in Durant. The tribal legislature meets at the Council House, across the street from the historic Choctaw Capitol Building, in Tuskahoma. The Capitol Building is now the Choctaw Nation Museum..
Those Choctaw who removed to the Indian Territory, a process that went on into the early 20th century, are federally recognized as the Choctaw Nation of Oklahoma. The removals became known as the " Trail of Tears." The Tribal Headquarters are located in Durant. Opened in June 2018, the new headquarters is a 5-story, 500,000 square foot building located on an 80-acre campus in south Durant joining other tribal buildings such as the Regional Health Clinic, Wellness Center, Community Center, Child Development Center, and Food Distribution . 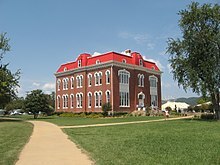 Previously, headquarters was located in the former Oklahoma Presbyterian College, with more offices scattered around Durant. The current chief is Gary Batton  and the assistant chief is Jack Austin, Jr. The Tribal Council meet monthly at Tvshka Homma. The General Fund Operating Budget, the Health Systems Operating Budget, and the Capital Projects Budget for the fiscal year beginning October 1, 2017 and ending September 30, 2018 was $516,318,568 . 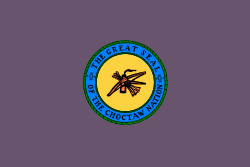 The supreme executive power of the Choctaw Nation is assigned to a chief magistrate, styled as the "Chief of the Choctaw Nation". The Assistant Chief is appointed by the Chief with the advice and consent of the Tribal Council, and can be removed at the discretion of the Chief. 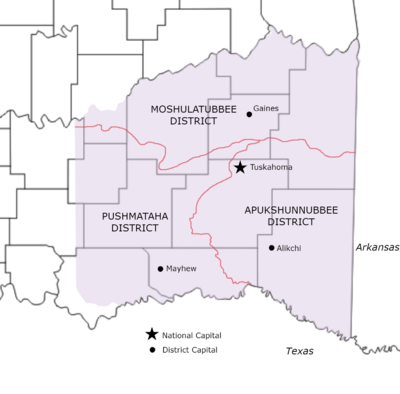 The current Chief of the Choctaw Nation is Gary Batton, and the current Assistant Chief is Jack Austin, Jr.
Before Oklahoma was admitted as a state to the union in 1907, the Choctaw Nation was divided into three districts: Apukshunnubbee, Moshulatubbee, and Pushmataha. Each district had its own chief from 1834 to 1857; afterward, the three districts were put under the jurisdiction of one chief. The three districts were re-established in 1860, again each with their own chief, with a fourth chief to be Principal Chief of the tribe. These districts were abolished at the time of statehood, as tribal government was dissolved. The tribe later reorganized to re-establish its government. In order to be elected as council members, candidates must have resided in their respective districts for at least one year immediately preceding the election. "Candidates for the Tribal Council must be at least one-fourth (1/4) Choctaw Indian by blood and must be twenty-one (21) years of age or older at the time they file for election." Once elected, a council member must remain a resident of the district from which he or she was elected during the term in office. This policy ensures the involvement and interaction of successful candidates with their constituency. The Choctaw Nation's annual tribal economic impact in 2010 was over $822,280,105. The tribe employs nearly 8,500 people worldwide;  2,000 of those work in Bryan County, Oklahoma. The Choctaw Nation is also the largest single employer in Durant. The nation's payroll is about $260 million per year, with total revenues from tribal businesses and governmental entities topping $1 billion. 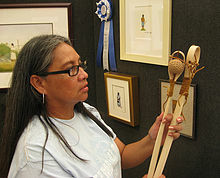 The Choctaw Nation operates several types of businesses. It has seven casinos, 14 tribal smoke shops, 13 truck stops, and two Chili's franchises in Atoka and Poteau. It also owns a printing operation, a corporate drug testing service, hospice care, a metal fabrication and manufacturing business, a document backup and archiving business, and a management services company that provides staffing at military bases, embassies and other sites, among other enterprises. The Choctaw Nation is the first indigenous tribe in the United States to build its own hospital with its own funding. The Choctaw Nation Health Care Center, located in Talihina, is a 145,000-square-foot (13,500 m2) health facility with 37 hospital beds for inpatient care and 52 exam rooms. The $22 million hospital is complete with $6 million worth of state-of-the-art[ clarification needed] equipment and furnishing. It serves 150,000–210,000 outpatient visits annually. The hospital also houses the Choctaw Nation Health Services Authority, the hub of the tribal health care services of Southeastern Oklahoma. At Andrew Jackson's request, the United States Congress opened a fierce debate on an Indian Removal Bill. In the end, the bill passed, but the vote was very close: The Senate passed the measure, 28 to 19, while in the House it passed, 102 to 97. 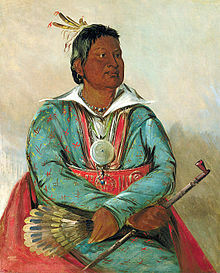 Jackson signed the legislation into law June 30, 1830,  and turned his focus onto the Choctaw in Mississippi Territory. In 2015 a sculpture known as ' Kindred Spirits ' was erected in the town of Midleton, County Cork, Ireland to commemorate the Choctaw Nation's donation. A delegation of 20 members of the Choctaw Nation attended the opening ceremony along with the County Mayor of Cork. Several Choctaw Indians serving in the 142nd Infantry suggested using their native tongue, the Choctaw language, to transmit army secrets. Their gambit proved very successful, and almost immediately contributed to a turn-around on the Meuse-Argonne front. Captured German officers said they were baffled by the Choctaw words, which they were completely unable to translate. According to historian Joseph Greenspan, the Choctaw language did not have words for many military ideas, so the code-talkers had to invent other terms from their language. Examples are "'big gun' for artillery, 'little gun shoot fast' for machine gun, 'stone' for grenade and 'scalps' for casualties." Historians credit these soldiers with helping bring World War I to a faster conclusion. On August 24, 1970, just hours before it would become law, Richard Nixon signed a bill repealing the Termination Act of 1959. 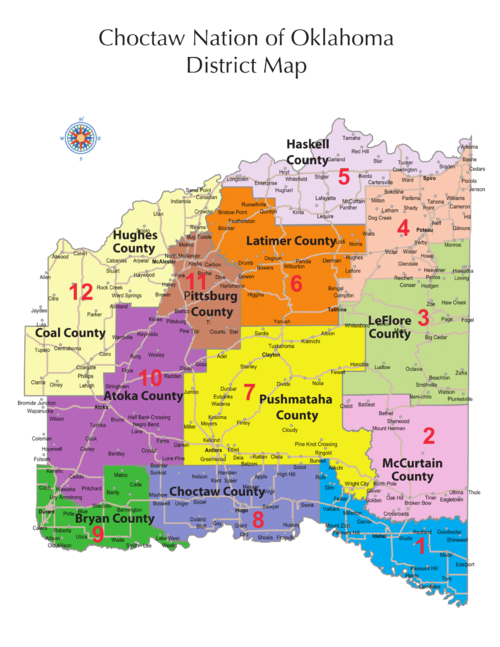 [ clarification needed] This close call prompted some Oklahoma Choctaw to spearhead a grassroots movement to change the direction of the tribal government. In 1971, the Choctaw held their first popular election of a chief since Oklahoma entered the Union in 1907. ^ a b Lambert, Valerie (2007). "Political Protest, Conflict, and Tribal Nationalism: The Oklahoma Choctaws and the Termination Crisis of 1959–1970". American Indian Quarterly. University of Nebraska Press. 31, No. 2 (Spring 2007): 283–309. doi: 10.1353/aiq.2007.0024. JSTOR 4138948.